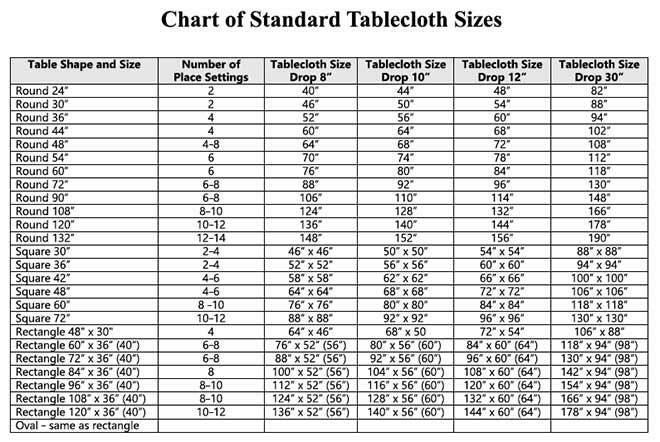 A chart for standard tablecloth sizes is an excellent tool for finding the perfect size you need for your next tablecloth purchase. You can quickly reference it instead of trying to guess the correct size. The following steps are quick and easy to follow when using the printable pdf chart. Download and print the chart so you can save and use it when you need it. Click to download and print the chart. Find the shape and size of your table using the far left column in the chart. If you don't know the size, use a retractable tape measure to take an exact measurement. This will give you the size of the tabletop and the measurements you'll use to determine the tablecloth size you need. Rectangle and oval tables come in two standard widths. The most common is 36" and the other is 40" wide. For a round table you will to know the diameter. Measure the center of the table from one end to the other. Square tables range from 30" to 72". You can determine the size of your table by measuring one side. Decide the length of the drop, which is the amount of material that will hang over the edge of the table, you want for your tablecloth. If you're undecided, then sit down at the table and with a ruler or tape measure find 8", measuring from the edge of the table. If this length isn't as long as you'd like, then try 10" and finally 12". Now that you know the size of your table and the drop length you want, you're ready to find the size of the tablecloth you'll need with the chart. For example if your table is round and 120" in diameter and you want an 8" drop, you will first find your table size underneath the Table Shape and Size column. Next, move across the chart underneath the Tablecloth Size Drop 8" column. The tablecloth size you need is 136" in diameter. To find the tablecloth size needed for a 42" square table with a long drop, find the table shape and size underneath the Table Shape and Size column. Next, move across the chart underneath the Tablecloth Size Drop 12" column. The tablecloth size you need is a 58" x 58" square. To find the tablecloth size needed for a rectangle or oval table, you will use the length and width measurements you took earlier. In the chart listings you will see that the (40") widths are shown in parentheses in the Shape and Size column as well as each of the Tablecloth Size Drop columns. If your table is a rectangle shape and measures 72" x 36" and you wish for a 10" drop, then the tablecloth size you need is 92" x 56". If your table has a 40" width instead of 36", then you would use the numbers in parentheses - (60") for a tablecloth size of 92" x 60". For an oval table, you will use the rectangle size measurements and the correlating tablecloth sizes. Just be sure that when you purchase the tablecloth it is meant for an oval table and not a rectangle table. The material of a standard tablecloth needs to fall over the edge of table. That material is called a drop and it impacts the length you need so the tablecloth fits your table and provides the look you desire. The drop length can vary depending on the dining event or personal preference. The standard drop length used by most food and catering services is 8". This means that the tablecloth will drop 8" over the edge of the table, evenly on all sides. You aren't limited to only using 8" for the drop in your tablecloth. Many people prefer the look of a 10" or 12" drop. 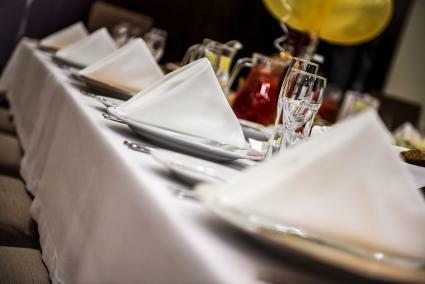 However, these lengths tend to be uncomfortable for some diners since the tablecloth often bunches up underneath the table or makes it difficult for diners to move or even sit underneath the table. That's why the food service industry uses the 8" standard. If you want the banquet look where the tablecloth touches the floor, then the standard drop is 30". This drop length is used mostly for banquets dinners, especially wedding receptions. A 30" drop length will mean that the tablecloth puddles slightly on floor. Using the chart you have a quick way to find the correct size for any standard size tablecloth. With the various options for drop length, the chart becomes a highly valuable tool for making the right purchase for your next tablecloth.